Okay, so not a picture-perfect dish, this one; its virtues lie solely in how it tastes. ‘I don’t know what to cook tonight,’ I typed to my mum over Skype. One delicious and easy variety of stir-fry in Thai cuisine is the combination of a vegetable, eggs, and seasoning sauces. 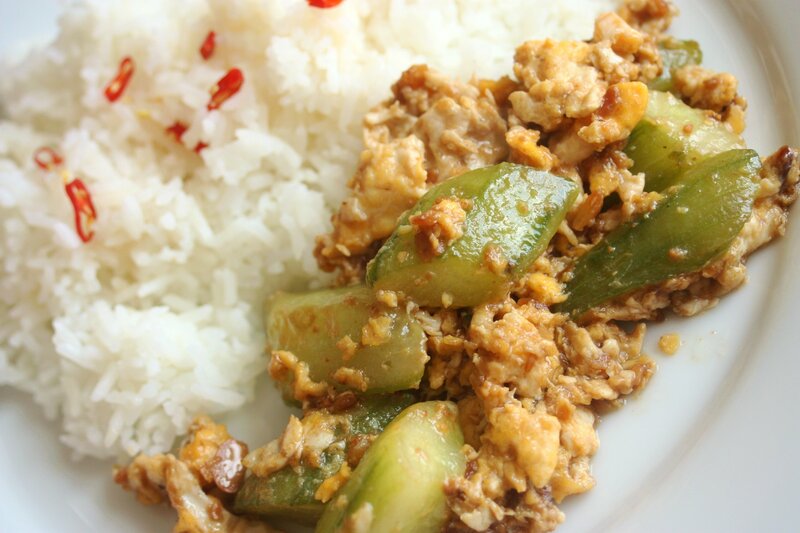 You might have seen Leela’s luffa gourd and egg stir-fry, or perhaps pumpkin and egg. These dishes are very common in Thai homes and Thai eateries in Thailand, but perhaps it’s seen as a little too humble and homely (in every sense) for overseas Thai restaurants, not quite fitting in the popular idea of Thai food as colourful and spicy. But please give it a try. 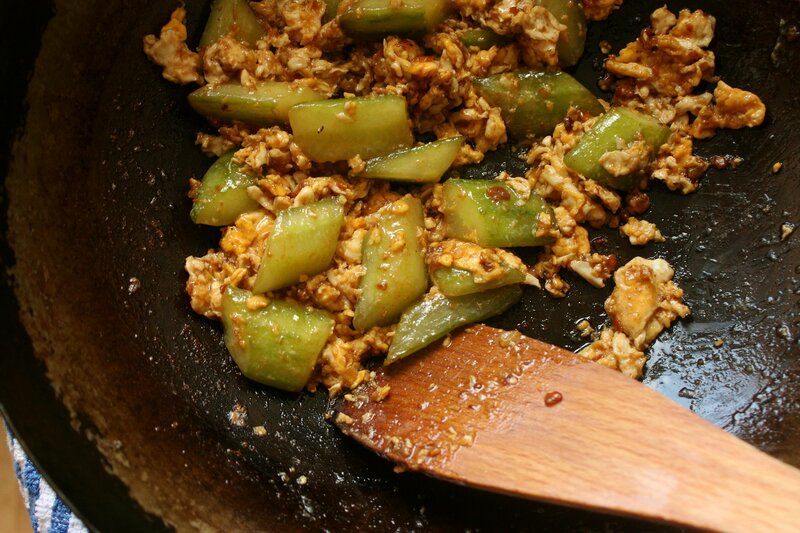 Cucumber and egg is probably for a lot of people an unexpected combination, but it’s a good one. I know it probably looks odd to people who are used to thinking of cucumbers as cool and crisp, and yes, ordinarily the idea of warm cucumber pieces makes me go ‘Nope.’ But I make an exception for this. Cucumbers are gourds and they become sweet and tender upon cooking. Ideally you’d use burpless cucumbers; these are easily available in Thailand but I’ve only managed to find them here in Chinatown for something like £2 for 6 little ones, an amount which I felt was better spent on massive packs of fresh lemongrass and galangal to be used straight away or frozen for curries and soups. Chiz. Luckily, it turns out for this dish the ordinary sort of slicing cucumbers are fine. Vegetarians rejoice: there is no hidden fish sauce in this. Fermented yellow bean paste (mentioned here) and mushroom oyster sauce make this dish have a bold, rich flavour. It’s mostly the tender eggs which carry the sauces, which in turn lightly coat the soft, sweet cucumbers. It is, as my mum said, decent with some hot rice. Prepare the cucumbers by cutting them into small portions. Slice off the stem end and cut the cucumbers in half cross-wise. Then, slice each cucumber portion into quarters, splitting them along their length. Cut each length of cucumber into small sections at a deep diagonal, you should get about 4 – 6 pieces. Set a large wok over a medium heat. Add the vegetable oil. When it’s warm, add the garlic and cucumber pieces all at once. Stir-fry them steadily, letting the cucumber cook until it turns slightly translucent and you can easily pierce them through the middle with a sharp knife. When it’s ready, clear a gap in the middle of the cucumber and crack in the eggs. Roughly mix the yolks and whites with your spatula, let the eggs just barely set, then break them up and mix them with the cucumbers. Off the heat, add the oyster sauce, yellow soybean paste, and sugar. Taste, quickly add more of any of the seasonings you like, then combine and plate up immediately. Cucumber and egg does indeed sound odd, but I’ll take your word for it that its good warm. Or at least “decent” as your mother said. She sounds like a wonderful (and clever/funny) lady! I had no idea that you could eat cooked cucumbers (or, more accurately, that they’d taste good!). Your stir fry does look delicious though!